It all starts the moment you contact us. Within a short time, you will meet with a roofing consultant who will perform a complete inspection of your roof. Measurements will be taken and discussion will take place on what it is you want to accomplish. At this point a detailed graph of your roof will be drawn up so accurate measurements can be taken. A spread sheet is then filled in with costs and then added up to achieve the final number. Once a proposal is written up and accepted, you will be given a proposed scheduling date. A detailed work order will be given to our project manager who then organizes the process for getting the roof installed. The project manager will then call you to discuss what will take place and what to prepare for. Once the crew arrives, usually around 7:30 am, they will introduce themselves to you and immediately get started. Our work day is usually 8 to 10 hours per day or until the job is completed. Typical residential jobs take 2-5 days to complete. Of course all roofing projects vary, depending on the size and scope of the work. Upon completion, your gutters will be hand cleaned, the roof blown off, and all materials and equipment removed. Within one or two days of completion, the roof will be inspected by our project manager for quality assurance. 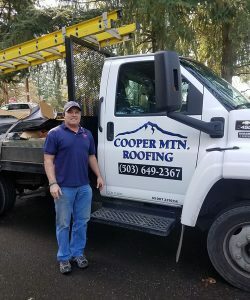 Cooper Mountain Roofing has perfected the installation experience which makes our jobs run smoothly, on time and in budget. We look forward to working with you on your next roofing project.